Several weeks ago, after much thought, I finally ordered a set of the Blackwing 602 pencils recently re-issued by the Cal Cedar Pancil Company as The Palomino Blackwing. I’ve long been fascinated by Blackwings– for those uninitiated with the them, Blackwings were a pencil produced by Eberhard Faber and noted for their very even, thick black lines and even strokes. A small amount of wax was mixed with the lead, making the effort of drawing or writing easier. Chuck Jones, Stephen Sondheim, and John Steinbeck were each 602 enthusiasts. After they were no longer manufactured (in 1998), proponents of Blackwings felt passionately enough to go to great lengths to acquire them. 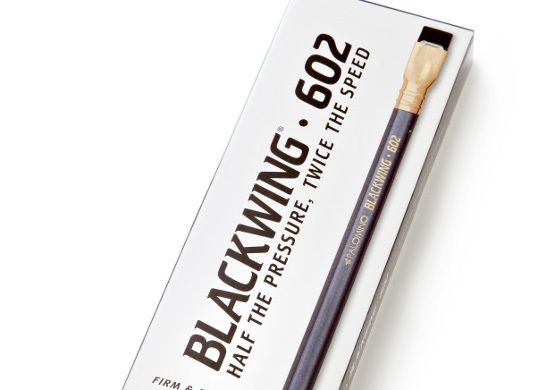 As of 2012 the cost of an original Blackwing 602 pencil on Ebay is about $40.00-$50.00. For a single pencil. Currently, someone is asking $38.50 for an empty Blackwing BOX (erm, no bids yet). In 2010 Cal Cedar took the mantel to attempt to reissue Blackwing pencils with the same properties, at the more reasonable price of $20.00 for a box. They’ve succeeded well. The modern Blackwings have a very even, black line with little pressure or effort. They glide over paper nicely and keep their points reasonably well (given the softness of the lead). I used several recently on some concept drawings for a client (sorry, my NDA precludes me from sharing here), and the quality of the lines meant substantially less clean up after scanning. Well played Palomino Blackwings!